Reading in Mind has been developed to assist Quebec elementary and secondary administrators and school personnel to develop, implement and evaluate a comprehensive reading action plan. Reading in Mind guides administrators and school personnel in the development of a collaborative reading action plan based on an informed selection of reading related factors. The process, strategies and resources equip school personnel to carry out a thorough analysis of the state of reading in the school and to select appropriate pathways to respond to school’s needs. 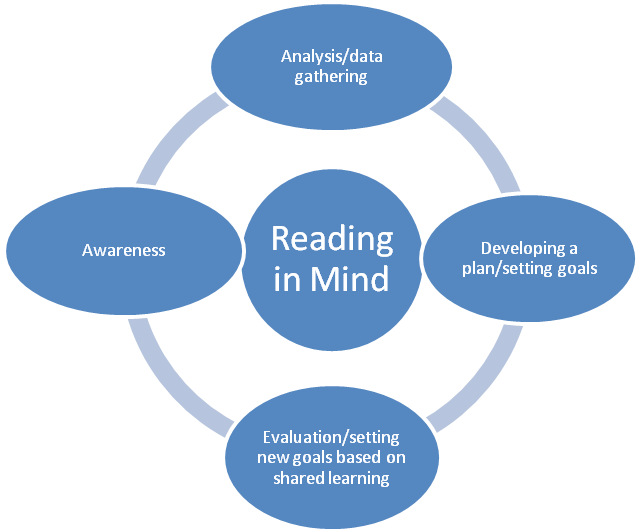 Reading in Mind has been developed based on research on student success and on effective practices in reading. Reading in Mind has been designed to assist schools in developing young readers' access to rich and authentic reading materials regularly and efficiently, and in becoming life-long readers. Reading in Mind provides data and strategies that may be included in the Management and Educational Success Agreement. rom the results of the survey, school personnel identify school-wide implementation strategies, evaluation and professional development to address selected reading targets. The proposed strategies for reaching the targets have been validated by research and successful field experiences in many Quebec schools. The personnel responsible for the Action Plan on Reading in School at the Ministère de l'Éducation, de l'Enseignement supérieur et de la Recherche (MEESR) and/or at the school board level can bring together groups of elementary and secondary school administrators interested in examining reading achievement in their schools. The training for Reading in Mind lasts approximately a half-day and includes a PowerPoint presentation, a hands-on run through of the survey and feedback. The basic training enables a school principal and, if desired, a vice-principal, lead teacher(s), and/or education consultant to examine and implement the basics of the process and to use the available online resources. There are a number of support and guidance possibilities available (e-mail, conference calls, Skype, telephone, presence in the school, user groups, etc.). The implementation of all the steps recommended by Reading in Mind stretches over a number of years. LEARN provides the web design and online technical support for Reading in Mind for both the French and English sectors. LEARN is a partner of the Ministère de l'Éducation, de l'Enseignement supérieur et de la Recherche (MEESR) and Récits nationaux.